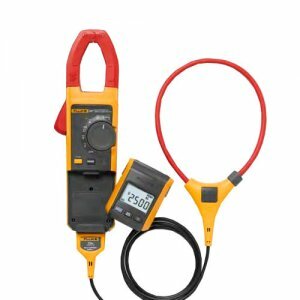 The Fluke 381 True-rms Remote Display AC/DC Clamp Meter w/ 18"-inch iFlex does everything you would expect from a clamp meter, and then lets you remove the display for even more flexibility. Now one technician can do jobs that used to require two people; clamp the Fluke-381 AC/DC Clamp Meter around a conductor, remove the display and walk across the room to operate controls or remove protective equipment, all while watching real-time readings. The new iFlex flexible current probe (included with the Fluke 381 True-rms AC/DC Clamp Meter) expands the measurement range to 2500A AC while providing increased display flexibility, ability to measure awkward sized conductors and improved wire access.